Splendid city-centre apartment. This freshly renovated Victorian flat is situated in Edinburgh's vibrant East End. You will be within 10 minutes walk of Holyrood Palace, the Scottish Parliament, the Royal Mile and Princes Street. There are lots of great shops and cafes right outside, and excellent access to bus routes. The apartment is on the first floor of a traditional tenement block. It was completely renovated in early 2017 with newly fitted kitchen, new shower room, and separate toilet and a new central heating system. The large and bright front room looks out to a church with views up London Road. This is the main living space, and it includes kitchen area, dining table, and, as of October 2018, a brand new John Lewis sofa bed. The sofa bed is slightly larger than a standard UK double, and has a sprung mattress to help extra guests get a good night's sleep. The kitchen is well-equipped, and there is a television and a bluetooth DAB radio you can use for entertainment. The bedroom is rear-facing, so it offers peace and quiet, despite the central location. There is a shower room and a separate toilet. Note, if you want to use the sofa bed in the lounge, be aware that room faces the front, so is a bit noisier. Pack earplugs if you're a light sleeper. The flat is equipped with an iron, ironing board and hairdryer. I'm a busy mum who loves travelling. I've enjoyed lots of self-catering holidays myself, in many brilliant properties (and occasionally cursed the lack of a bread knife or insufficient numbers of cups). We have equipped our apartment based on what we like to see when we travel - hopefully we've thought of everything. I'm lucky enough to be able to say Edinburgh is my home town, and I'm really looking forward to welcoming guests from all over the world to share our beautiful city. 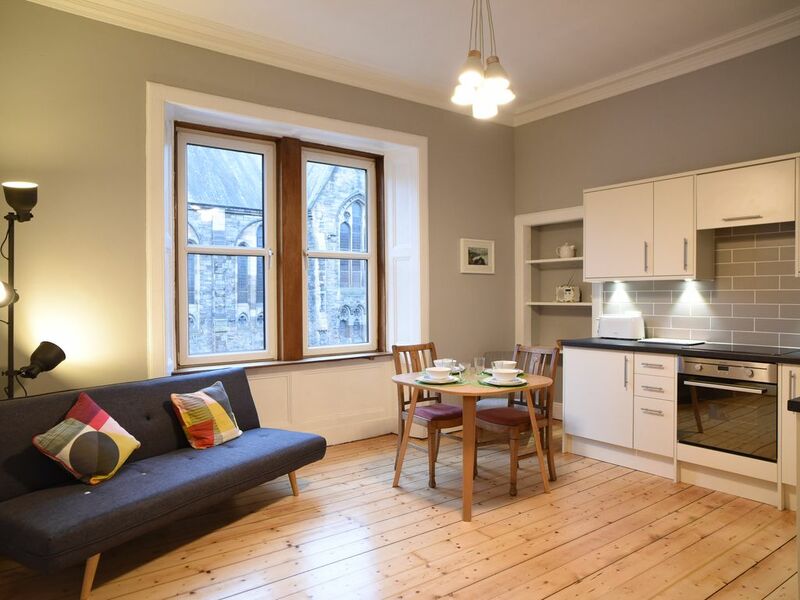 Recently renovated, with a fresh modern style in a beautiful traditional Edinburgh tenement. Ideal for a couple enjoying a city break as a base to explore the city, with an open outlook onto a broad New Town avenue and church. The East End location has its own local character which you will enjoy exploring, with a wide range of cafes, bars and independent shops, as well as easy access to the Royal Palace of Holyrood and Arthur's Seat. shower, Shower room, washbasin with mirror. Toilet separate. There is an integrated washing machine installed under the kitchen countertop. Broadband Internet available over WiFi. There is one main living area, which includes the kitchen and dining area as shown in photographs. The living area itself includes a 3-seater sofa, an easy chair, and a television. There is an integrated refrigerator under the kitchen countertop. Standard sized electric oven under the countertop. There is a cafetiere for making coffee. The kitchen is well equipped for a self-catering holiday. There is a freshly installed kitchen in the main living area, with all essentials including an electric oven and induction hob. There is also an integrated washing machine for use of guests. The living area includes a square table and four dining chairs. Internet-enabled high definition smart TV with Freeview TV channels and access to apps including BBC iPlayer. The TV can also be used to stream your own media over the network, or from a USB stick. The living room includes a Bluetooth DAB digital radio for guests to use. Very nice place with awesome location. A bit noisey at night in the living area but the befroom was very quiet! Great location & comfortable accommodations! This one bedroom apartment is perfectly appointed with all you could possibly need. The wifi and all of the appliances we utilized all worked great. The location is amazing and you could literally walk everywhere, though we did opt for an uber or taxi on occasion. We did walk to Hollyrood Palace, to the path for Arthurs Seat and to Colton Hill reaching our destinations in 10 minutes or less. There is a convenience store and atm next to the entrance of the apartment and two larger grocery stores just a minute or two walk away. Edinburgh is an amazing city with so much to see and enjoy. Kate was great at communicating and made sure we were greeted promptly even though we arrived later than expected due to airline issues. I highly recommend getting the Edinburg ticket which includes tickets for the Hop on Hop Off bus for 2 days, Edinburgh Castle, Hollyrood Palace and the Britannica Royal Yacht. Plan for a day to walk up to Arthurs Seat and then down the other side to Dunnington and visit the Sheeps Heid Inn. I would also highly recommend booking this comfortable and convenient one bedroom apartment the next time you visit Edingburgh. My wife and I stayed with our two daughters (ages 11, 13). The apartment was beautiful and clean and we appreciated having a washing machine and good WiFi. The futon bed in the living area worked fine for our kids, but it might be too small for two older teens to share. There are choices of grocery stores nearby and it is only a 15min walk to the Royal Mile. Edinburgh is a very walkable city, and I would recommend this to those with good mobility (for the hilly streets and steps up to the apartment). We really enjoyed staying in this apartment. It was very clean and tidy, the local information was helpful and the bed was comfortable. A high chair and cot were provided which were very useful. The location was very central and an easy walk to the centre of town and train station, plus parking was easy to find near the location. Thanks Katy!! The flat was clean, well organized, and close to bus stops, shops, and within easy walking distance of Holyrood Palace and the Royal Mile. It was very comfortable for the three of us. Exactly what we wanted. Thanks very much for the good review. Glad you enjoyed your stay! For a solo traveler this is the perfect place. The location near not only the bus line but tram line is perfect for visiting anywhere you want to go in the city. The park across the street is the perfect place to just sit and watch everything going on this beautiful city. The flat was immaculate with everything you need to eat in if you don't want to eat out all the time including stores not even a block away to buy anything you need. When I return will make sure I make my reservations in advance again so I can hopefully rent this same place again. Everything you read abut this flat on the website is true and would recommend it to anyone wanting to visit Edinburgh. I loved my two weeks there - Thank you. You're really spoilt for choice in this area. There's everything from basic no frills food to Michelin starred dining within 5 minutes walk. There will be more information in the apartment, but if you want to go for a special meal while you're in Edinburgh you may need to book in advance. A couple of fancier places nearby are Gardner's Cottage (http://www.thegardenerscottage.co/) and 21212 (http://www.21212restaurant.co.uk/) These would definitely need booked. For me though, you can't beat brunch in Red Kite café (a bit easier on the wallet) and the bread and cakes from Manna House are amazing!